Northern Lights marine generators generally do not have many issues, as long as proper maintenance and changing of filters is kept up with… however, if you are experiencing an issue with your generator, the problems are generally pretty easy to figure out / fix. In order to help address these common issues, we’ve put together this Northern Lights Generator Troubleshooting Guide. Below we’ve compiled the main issues that you may face with a Northern Lights generator, and provide you with solutions. Should you have any more questions, or concern about any of these issues, please contact Northern Lights support directly. This advice is meant to help, but not to replace advice from a specialist or Northern Lights support. IMPORTANT: Make sure to review warnings and safety precautions* below before working on marine generator. If not familiar / comfortable with working on machinery such as a generator, consider contacting an expert. Starter Not Working on Marine Generator? Engine Difficult To Start or Won’t Start? Do not start engine by shorting across start terminal. Start only from operator’s station. Stop engine before fueling. Never fuel a hot engine. Do not wear dangling clothing or jewelry while working on machine. Disconnect battery ground cable before working on generator. Relieve pressure before disconnecting pressurized lines. Escaping fluid under pressure can penetrate skin and cause serious injury. Make sure all connections are tight before re-applying pressure. 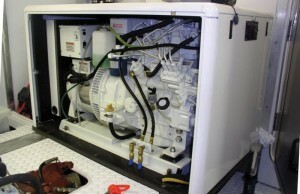 These are just some of the most common technical issues with marine generators. Should you have any further issues, please contact a specialist or Northern Lights support. Best Marine Generator Brand? Is A Diesel Generator Better? My northern lights 9k generator which is only 4 years old recently started dropping in volts occasionally. The generator will drop in volts from 110 to around 69 volts for a few hours and then come back up. Any info would be greatly appreciated. Hi Jeff, sounds like it’s the voltage regulator board. If you provide us with the serial number of your unit, we can get you an estimate for the board. We have an M773LW3.3 that has 389 hours on it. It’s been properly maintained and serviced, but it suddenly stopped working in the middle of the night. It will fire up and run for a few seconds, but then it shuts off and the 10 amp breaker ON the generator trips. We cannot attempt to restart it until we turn the breaker (on the generator) off and on, then hit the reset button (also on the generator). There COULD be an issue with the fuel pump, or grounding… but it was running perfectly prior to it shutting down in the middle of the night. In order to check if it is the injector pump, you would need to remove it and send it to a local fuel injection pump repair specialist. If you are getting a lot of shaking and black smoke, you may want to check for something else inside the engine as well. Most likely you have a bad ring, and that’s the reason you’re getting pressure into the lower system. I will send you more information via email. I have a older M813-12N(saw series) generator which is producing low voltage. around 79v on both lines. Capacitors test ok. Any ideas where the issue may contribute from? Hello Justin, more than likely there is a bad connection that is causing this I would start there first. I have a NL 673L2, recently the cycles per second has dropped from 60 to 57 CPS, the volts between 110 and up. Do I correct both thru the AVR? We have a 9KW Northern Lights generator. When running, the line voltage needle will flutter back and forth for about 15 minutes at a time. The RPMs decrease when this is happening. What can cause this? Hi can any body tell me what the cylinder head torque for the northanlights M773lW. 3 engin is also what is the compression on that engine. Did you change both, the primary and the secondary filter? If you did, please check your water exhaust temperature sender, you may have a faulty sender.